November 24th - December 5th: Non-Perishable Food Drive benefitting Northwest Harvest. Bring in 4 or more items of non-perishable food, get 10% off any one item. December 6th - December 19th: Winter Coat and Jacket Drive benefitting Mary’s Place. Bring in a lightly-worn coat or jacket for donation, get 10% off your purchase. December 19th - December 24th: Ugly Sweater Season! 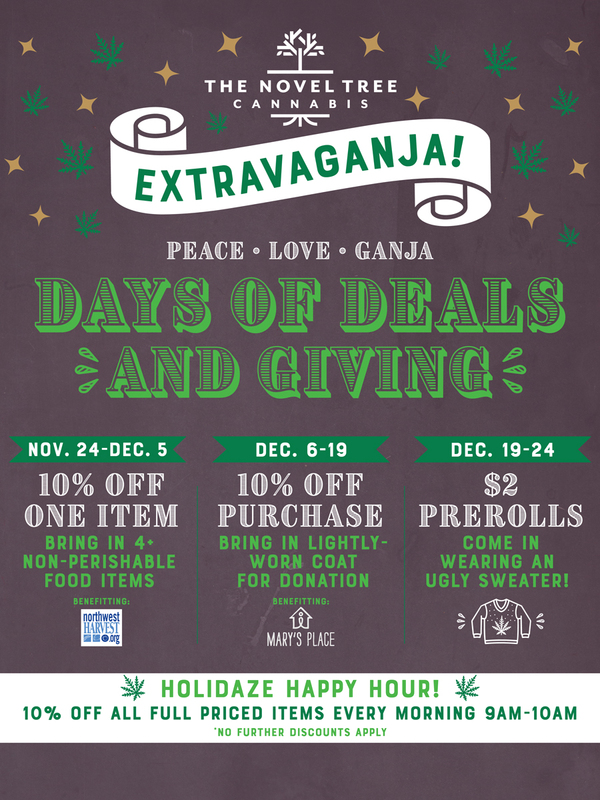 Come in wearing an ugly holiday sweater, and you can buy pre-rolls for only $2! Holidaze Happy Hour: Every morning from 9am-10am! Save 10% on ALL full-priced items. No further discounts apply.